Mary Lou Harrison, District Governor for 2018/2019 recently met with nine excited students prepared to travel, our own outbound student, Maddie Lamer included. These young people have been carefully selected to represent Canada, Rotary, and our District around the world. Having spent some time with them, Mary Lou can tell you that Rotary will be very well represented by these incredible students who will Be The Inspiration to many, both at here home and in their host countries. The Port Hope gathering was organized by our hard-working District 7070 Youth Exchange Committee for the outbound Youth Exchange students and their parents to learn more about the expectations and opportunities of the program and also to review practical issues like visas, passports, money management, language development, personal safety, and home sickness. 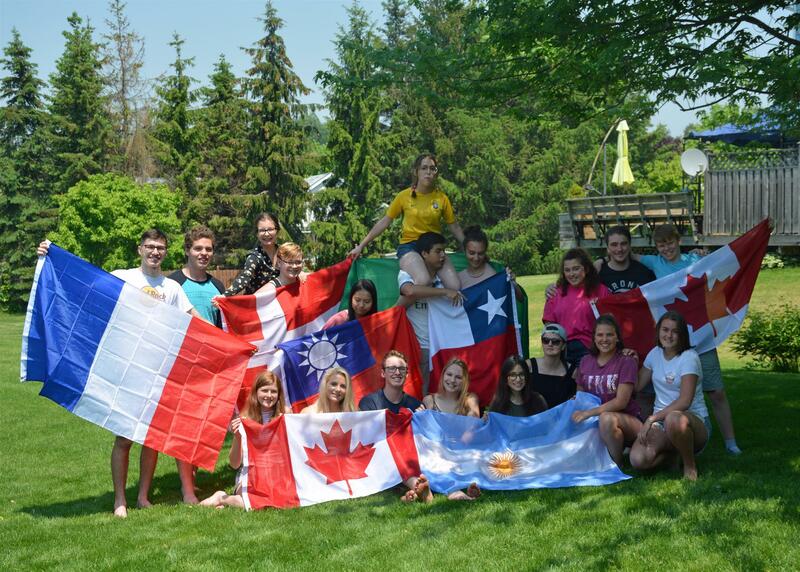 The current inbound Rotary Youth Exchange students joined in the discussions part way through, and the whole group had a pool party and social time after the morning training. (pictured is Maddie Lamer, back row in dark coloured top and Juan, the only student with another student on his shoulders). A common theme was the amazing opportunity that the Rotary Youth Exchange Program provides for Canadian students to develop a variety of personal skills during their time in another country, including self-reliance, confidence, public speaking, problem solving, and interpersonal communication, not to mention mastery of a new language. Thank you to the Rotary Clubs of Belleville, Brighton, Campbellford, Cobourg, Picton, Port Hope, Port Perry, Stirling, and Trenton for sponsoring inbound and outbound students in 2018-19. And thanks to the Rotary Club of Markham-Unionville for hosting a student this year and sending a student next year. Peace and Conflict Resolution is one of Rotary six Areas of Focus, and there is no more effective way of creating Peace Ambassadors in our world than by participating in the Rotary Youth Exchange Program.